Surf Casino will then reward you with a bonus (Welcome Bonus is for new players only). The terms and conditions of the bonuses vary between different casinos and might also change over time and between different countries, so it is important to compare the different offers and read the T&C for Surf Casino before signing up. SurfCasino is an instant-play gambling venue owned by Direx N.V, an experienced Curacao registered company with more than 20 online casinos under their belt. Direx casinos are powered by some of the best providers in the business, known by their versatile offer, sophisticated software, and exceptional visual presentation. Some of Direx casinos have accumulated a high number of positive user ratings and received certificates of trust, issued by independent sites that specialise in online gambling. 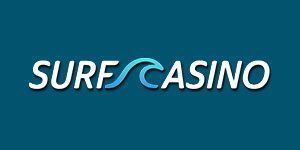 Launched in 2017, SurfCasino fits the pattern of its sister sites – it combines a great selection of games, clear layout and an extremely easy sign-up process that allows the registration to be completed via social media. Additional information that cannot be pulled from one’s social media profile can be provided later on, prior to funding the casino cashier. The games in SurfCasino are divided into 5 categories: Slots, Roulette, Blackjack, and Live. Except for introducing an advanced search system that enables the players to filter the games according to the provider, SurfCasino does not include any additional, more precise filtering parameters. Considering the volume of games, this is inconvenient, especially if you would like to focus on games with specific features such as volatility or hit frequency. You will, however, be able to see the summary of the latest or the most popular releases on the casino’s homepage. The SurfCasino is powered by more than a dozen developers (BetSoft, Quickspin, Play’n GO, Microgaming, Yggdrasil, Big Time Gaming, Habanero, Endorphina) and Immortal Romance, Vikings Go Berzerk, Big Bad Wolf, Riche Wilde and the Book of Dead are among the most popular titles. Another minor disadvantage is the lack of the demo play option. The registered members will be able to launch a certain game, however, the “insufficient funds” window will remain on the screen until the first deposit is cleared. This is actually where the lack of extra filters really becomes annoying since the entire slot catalog is crammed up in a single category. In other words, the system will not even allow you to focus on progressive slots and you will be forced to browse through hundreds of games in order to find what you need. In some cases, the slots will have the number of lines displayed on the preview image, or a progressive jackpot amount visible in the bottom left corner. This brings us to yet another shortcoming of SurfCasino website – when you launch the game, you will be transferred on a different screen with no direct access to the casino lobby. To return to the previous screen, you will need to interrupt the session and go back to the main category, starting your search from scratch. SurfCasino has a neat selection of casino games, which the players can find in three different categories – Roulette, Blackjack, and Live. The first two categories combine the selection of both the Live Dealer tables and their virtual counterparts. In the Roulette category, the players will find double and single zero options, Multi Wheel Roulette, the version with the La Partage rule, Premier Roulette, etc. Apart from different versions of 21, the Blackjack section also includes War, Top Card, Caribbean Stud, and Holdem. This category is packed with Video Poker, virtual sports, scratchcards, keno, speciality games, and bingo variants. The selection is amazing and much more versatile than in a majority of online casinos. SurfCasino accepts deposits placed in EUR, SEK, USD, AUD, CAD, and RUB. The available payment methods are Visa, MasterCard, Maestro, Skrill, Neteller, Qiwi, Yandex, Sofort, Paysafecard, Zimpler, and Cubits. Processing time is instant and the minimum amount that can be deposited is €10, regardless of the method. The deposits are capped at €10,000, or €250 for Paysafecard users and €5,000 for Zimpler users. Withdrawals start at €20 and have the same upper limit as deposits – €10,000. Once the payout is approved (usually in 2 to 3 hours), it can take up to 5 days for the money to appear on the user’s account. The number of withdrawals is not limited and multiple requests can be submitted. Issues that are not addressed in the FAQ section can be resolved with the SurfCasino client service representatives. To chat with an agent, you need to launch the Live Chat service ( pinned at the bottom of the page and available 24-7), provide your name, email address, and a short version on your question. Inquiries that do not require immediate attention (remarks, suggestions, or feedback) can be submitted through the online contact form.